The smallest cetacean that occurs around the coast of Kent. It has a robust body, small rounded head and no beak. It has a centrally placed dorsal fin which is small and triangular in shape. The body colour is dark grey, merging to a lighter grey on the sides with the underside being white. They have a quick surface rolling action and when alarmed or moving at speed at the surface their movment can produce a rooster tail splash that is quite distinctive. Favours inshore waters, either alone or in small groups. Generally they are not showy, being quiet, unobtrusive mammals. Their small size makes them very difficult to observe in all but the calmest sea conditions. Unlike many dolphin species they are shy, rarely approaching boats. Around Kent, the only likely confusion species is Bottle-nosed Dolphin and then only at long range. 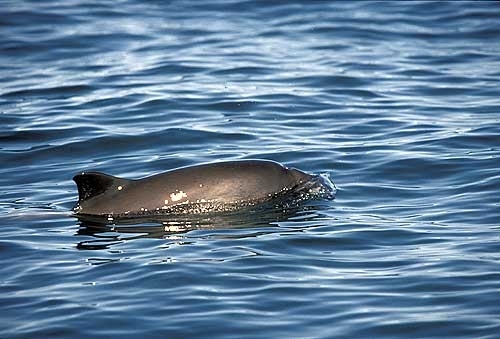 The Bottle-nosed Dolphin also has a centrally placed dorsal fin and is generally grey in colour. However it is a much larger mammal, with a pronounced beak and larger dorsal fin. 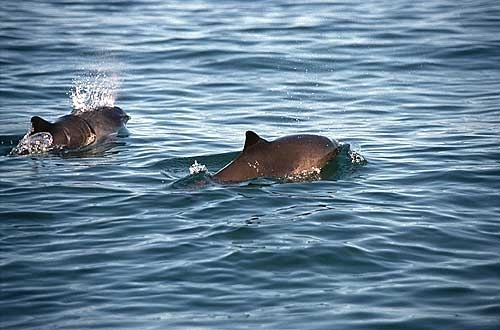 It generally does not show the unobtrusive behaviour of the Harbour Porpoise. Population unknown. Regularly observed from the point at Dungeness where a small population est. 6-10 animals occurs all year. Also seen occasionally in the Thames, Swale and off St. Margarets Bay. In Kent, there are no boat operators that provide a trip to see these marine mammals. 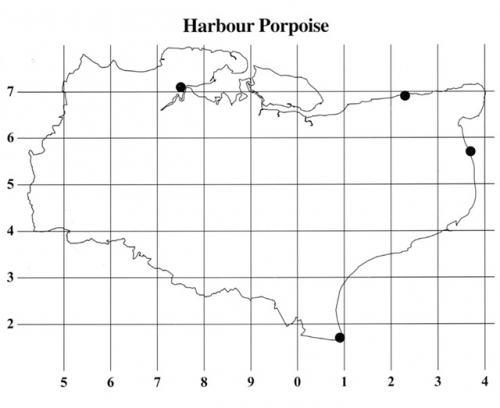 Due to their habit of being inshore species it is possible to observe harbour porpoise from the shoreline and they can occur anywhere around the Kent coastline and estuaries. Pollution, by-catch, net entanglement, acoustic disturbance and over-fishing are serious threats to this species. The European population has declined significantly in the last 30 years.